Krabi (Thailand) – May 15, 2017 (travelindex) – The ShellSea, the five-star beach resort that opened on 2 April adjacent to Krabi’s famed Shell Fossil Beach, is offering a special opening package from now until 30 June 2017 in which the starting rate for rooms begins at THB 5,000 (exclusive of service charge and taxes) for a Garden View room. The package includes breakfast for two, free Wi-Fi internet connection in the room and throughout the resort, and complimentary shuttle bus to Aonang Beach twice daily on a fixed time schedule. 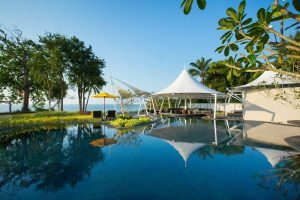 The resort offers 72 spacious guestrooms, 12 luxurious villas and one grand villa, with 180-degree views of the Andaman Sea and facilities that include a lap pool, family pool, spa, restaurants, beachside bar, and a selection of non-motorized recreational water sport equipment. The ShellSea is set directly on a 300-metre golden-sand beach that links directly with the famous shell fossil plate, thereby offering guests classic beachfront resort relaxation along with the opportunity to explore one of Krabi’s prime attractions. The resort is family-friendly, with a Kids’ Club and a pool suitable for families with young children, and a separate 36-metre lap pool for adults. The resort has been subtly designed into zones, so that couples and others preferring privacy are not disturbed by families with young children.